If you expect to purchase property in the near future, sooner is probably better than later. That’s because, according to real estate experts and financial forecasters, buying a home will just get more expensive with time. Every month you wait could make your purchase more expensive. Where Are Home Prices Headed In 2018 And Beyond? May’s Case-Shiller Home Price Index showed prices in 20 major metropolitan areas up 5.7 percent over the same time last year. Assuming this holds true in your location, a $200,000 house today would cost $211,400 next year. Of course, price increases are not uniform. Housing supply is low nationally, because home builders have not kept up with demand from new buyers. But some places are experiencing higher demand than others, and the influx of new residents is driving prices higher still. 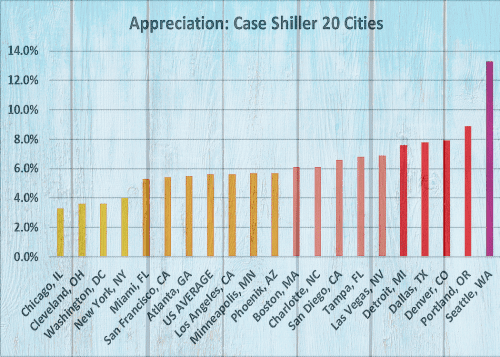 The cities below all have appreciation rates that exceed the national average — in some cases, their appreciation rates are more than twice the national average. If you try buying a home next year in Seattle, you’ll need a bigger down payment and more income to qualify for the same house. And that’s assuming that mortgage rates don’t change over the next year. However, most experts believe that they will go higher. Earlier this year, we published a collection of six mortgage rate forecasts from leading analysts at Fannie Mae, Freddie Mac, Kiplinger, the Mortgage Bankers Association (MBA), the National Association of Realtors (NAR), and Black Knight Financial Services. Projected rates ranged from 3.8 percent from Fannie Mae (which has already proved to be low) to 4.8 percent from the MBA. We at The Mortgage Reports have projected that rates will hit 4.3 percent at the start of 2018. The chart below shows the median home price now, the payment for a 3.875 percent home loan with 20 percent down if buying today, and the price and payment for the same house a year from now if the current appreciation rate holds up. So, how much more will you need to earn if you wait another year before buying? It depends on your location, and what happens to rates and prices. But that’s not the purpose of this post. There are ways to buy sooner. Mortgage insurance, whether private or provided by the government, gets a bad rap because it does increase your payment (unless you’re lucky enough to be eligible for VA home loans). But depending on the program, mortgage insurance may cost less than waiting to get 20 percent down. For instance, if you have good credit and ten percent down, your private mortgage insurance would add just .5 percent to your annual percentage rate (APR). That’s a little less than the TMR’s projected rate increase for 2018, and the good news is, it automatically goes away once you pay your balance down to 78 percent of the home’s purchase price. 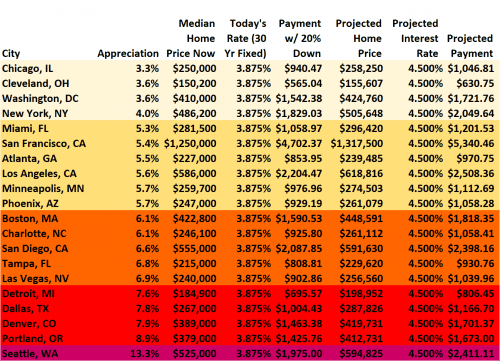 So you lock in today’s low rate and lower home prices. Both government-sponsored enterprises (GFEs) Fannie Mae and Freddie Mac offer 97 percent financing. If you meet eligibility guidelines for Fannie Mae’s HomeReady or Freddie Mac’s Home Possible, you get discounted mortgage insurance and flexible underwriting. FHA allows you to finance 96.5 percent of your purchase, and FHA borrowers tend to get approved with lower FICO scores. Did you know that the majority of properties in the US qualify for down payment assistance? Or that many people who would be eligible don’t even apply? Down payment assistance, or DPA, comes from government agencies, charitable organizations, employers and others. You may be able to grab a low- to no-interest loan, a forgivable loan, or a grant if you qualify, or if you buy in a designated redevelopment area. A lease option means entering into an agreement to purchase a house at a future date, for a price you agree on today. While that won’t help you get today’s low mortgage rate, it can get you today’s home price. Just make sure that you get an appraisal and inspection to make sure you’re actually getting a fair deal, and that the price reflects today’s market, not tomorrow’s. And it’s smart to have a lawyer look at your agreement before you sign. Some scammers sell the same house again and again with a lease option, because they make the terms so harsh that no one can complete the purchase. Younger buyers especially may find it harder to afford housing when they are repaying student loans and just beginning their careers. Buying a home with a (good!) friend who is responsible enough for homeownership could be the best way to pull off a real estate venture. You can both stop renting and start accruing home equity now. Just make sure you hammer everything out in writing. And always purchase with the idea that someday you will want out of the arrangement. Make sure your dissolution will go smoothly and be fair to all parties. Today’s rates are already higher than those projected by Fannie Mae and Freddie Mac, but they are still low enough to make buying a home affordable in many parts of the country. Contact several lenders (easy to do online), compare offers, and choose the most affordable program to get you in the door asap.